Rocky Road Cheesecake is rated 4.7 out of 5 by 3. Rated 5 out of 5 by Docttrue from Excellent customer service I had a cheesecake sent to a friend but it was delayed by weather. When it wasn’t delivered by the promised delivery, I notified the company. They said the cheesecake was perishable and would be replaced with a next day delivery. The new cheesecake arrived in perfect condition and was delicious. Excellent customer response and service! Rated 4 out of 5 by Ricky from I'm glad that I ordered the Rocky road cheesecake I'm glad that I ordered the cheesecake. I'll be ordering again soon. This dessert is sinfully good. 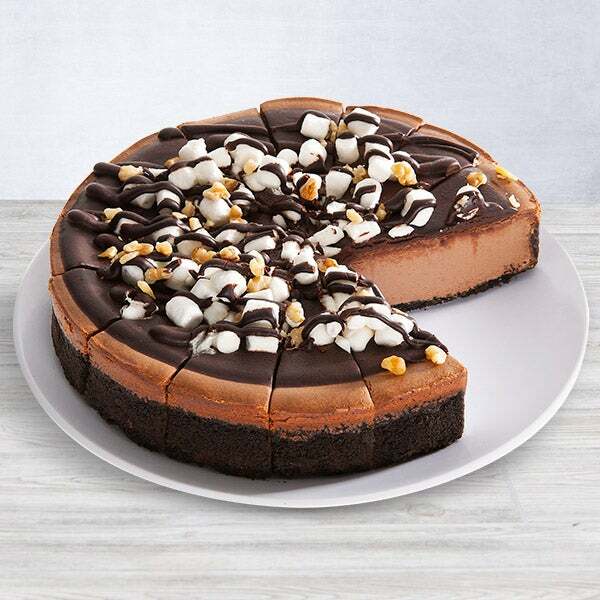 Comprised of our creamy, smooth chocolate cheesecake, coated with a layer of decadent chocolate fudge, and topped with gooey marshmallows and crunchy walnuts, this sweet dessert is then baked into a chocolate cookie crust. So, basically, it's the greatest dessert of all time. And you can trust us - we're sort of experts.